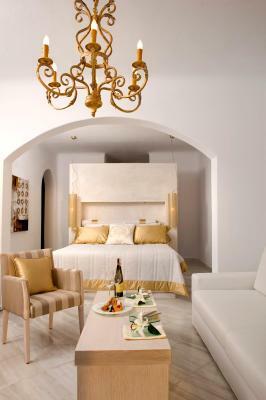 Lock in a great price for Gold Suites - Small Luxury Hotels of the World – rated 9.3 by recent guests! The room, the stunning location and view, the staff was very nice and friendly. It was easy to get around and the view from our room was just priceless. 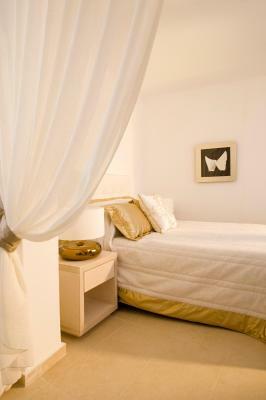 Rooms where very clean and beautifully and authentically desiged. Our stay was fabulous. The staff were amazing. Really enjoyed our stay. The staff was the best! They bent over backwards at every need and for everyone’s needs. Worked really hard and super nice. They all made the hotel. The location is out of this word amazing! Simplistic which was great. I’d stay there again. The view was incredible, along with the staff and the beds. Fantastic staff. Wanted to meet needs of guests, Dina, in particular was excellent and went the extra mile every day. 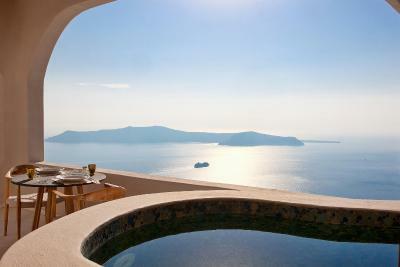 The breakfast served on your private balcony is spectacular. The staff, the breakfast, the room, the view. EVERYTHING was perfect. 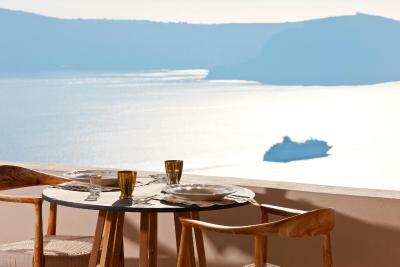 Gold Suites is situated in Imerovigli, right on the cliff of the Caldera. 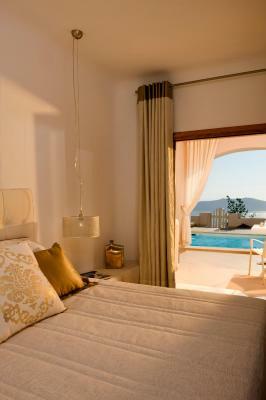 It has uninterrupted views of the volcanic crater and offers modern accommodations with traditional Cycladic elements. 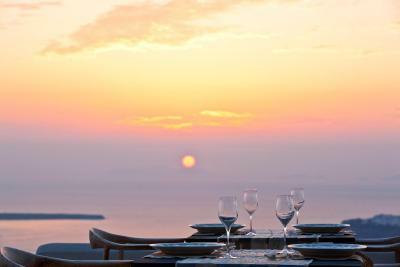 Guests can enjoy the famous Santorini sunset on the sun terraces by the swimming pool overlooking the Aegean sea. Light snacks and drinks are offered at the pool bar throughout the day. 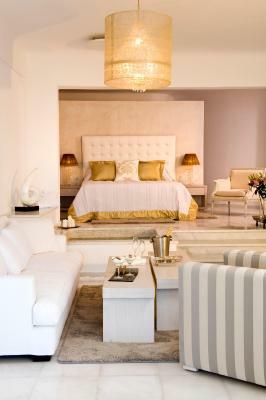 Gold's suites feature spacious living rooms and private verandas. 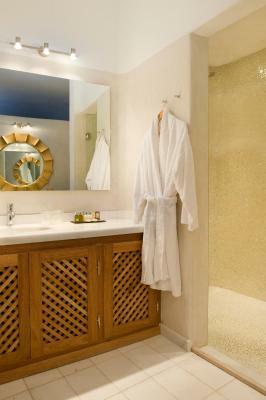 They offer satellite TVs and refrigerators and the bathrooms are equipped with bathrobes, slippers and bathroom supplies. 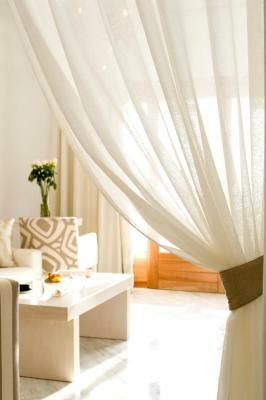 Other services include twice daily maid service, free Wi-Fi access and wedding planning upon request. 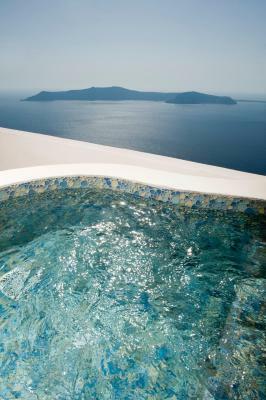 Gold Suites hotel is less than one mile from the town of Fira and 6 miles from Santorini airport. 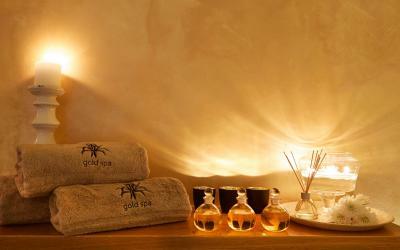 When would you like to stay at Gold Suites - Small Luxury Hotels of the World? 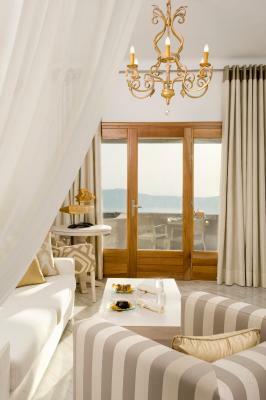 Spacious open-plan suite offering luxurious decoration and views to the caldera. 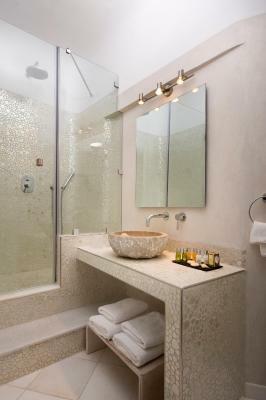 It includes an open-plan bedroom with a queen-size bed, and a bathroom with a rain shower. 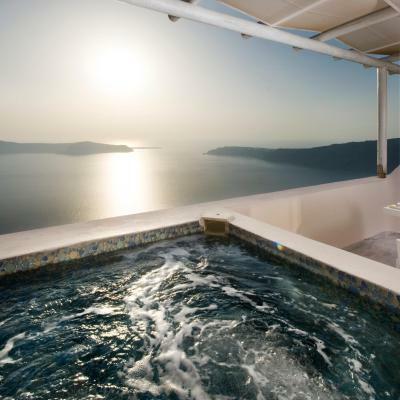 Luxurious and spacious suites with their private, large veranda featuring a heated hot tub, sun beds and views to the caldera. 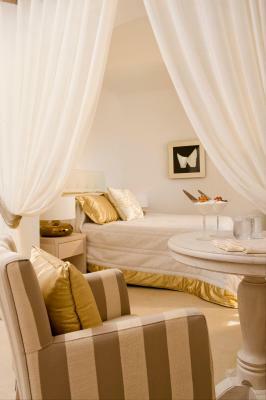 It includes an open-plan bedroom with a queen-size bed and living room. 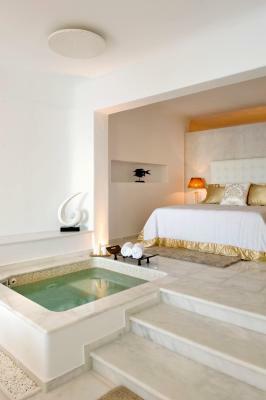 Spacious suite offering a large veranda with a private heated pool, loungers, and dining area with views to the caldera. 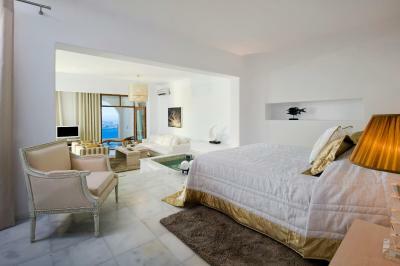 It includes an open-plan bedroom with king-size bed and living room. 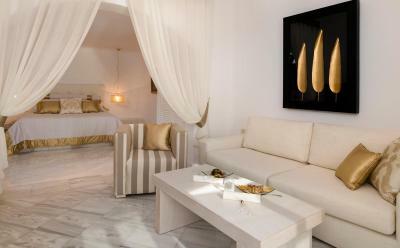 A stylish suite with outdoor, private, heated pool, elegant sun loungers and views of the Caldera. 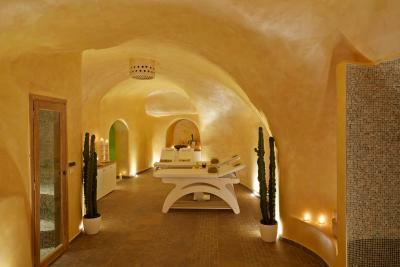 It includes an open-plan bedroom with king-size bed and living room, a bathroom with a rain shower and hammam, and a walk-in wardrobe. 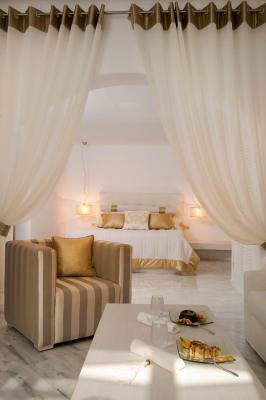 Luxuriously decorated suite with views to the Caldera and the volcano. 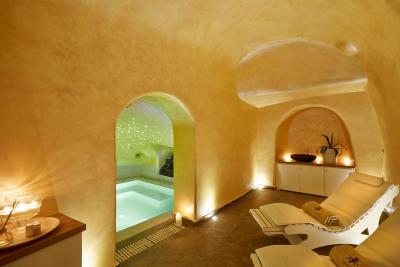 House Rules Gold Suites - Small Luxury Hotels of the World takes special requests – add in the next step! 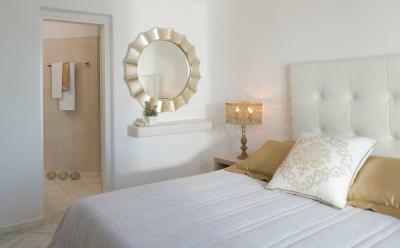 Any additional adults are charged EUR 150 per night for extra beds. Gold Suites - Small Luxury Hotels of the World accepts these cards and reserves the right to temporarily hold an amount prior to arrival. Please note that for bookings of 2 or more rooms, group policies apply. 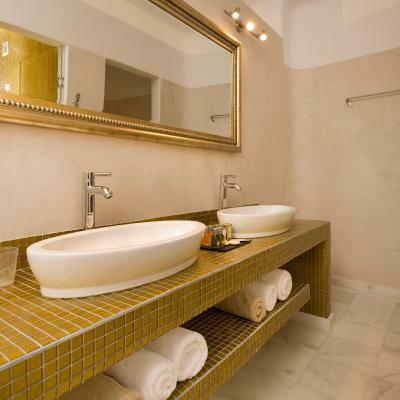 Please inform Gold Suites - Small Luxury Hotels of the World of your expected arrival time in advance. You can use the Special Requests box when booking, or contact the property directly using the contact details in your confirmation. The bathrooms are a little small. I really like the location! It had a great view and breakfast was amazing. The guy in the reception was extra helpful. The hot tub was great! And they upgraded us! We didn't feel that the price of the accommodation was reflected in the room and our bed was very uncomfortable. Santorini is a unique place and it was wonderful to spend time there at the end of season, when most of the crowds had dispersed. We absolutely loved everything about our stay! The balcony (on which we had a private plunge pool) was unfortunately exposed to a persistent cooling wind. Not ideal when wanting to enjoy the pool. 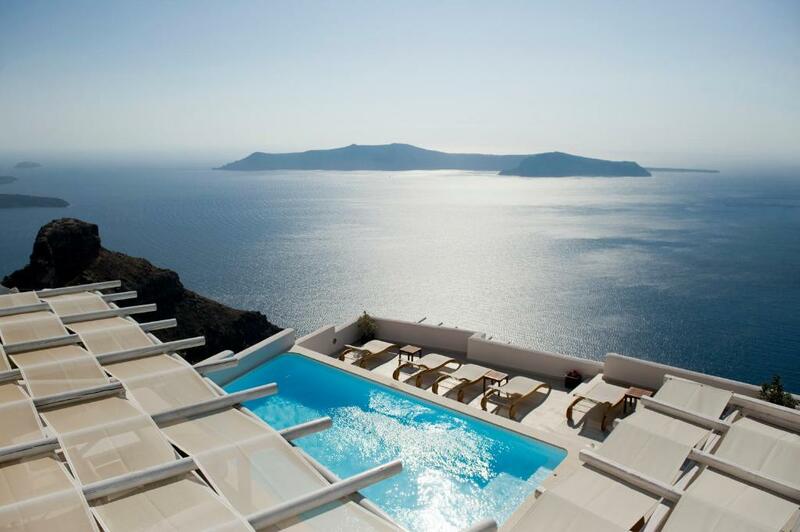 Fabulous view across the caldera. Excellent breakfast options delivered to our room (balcony) every morning. 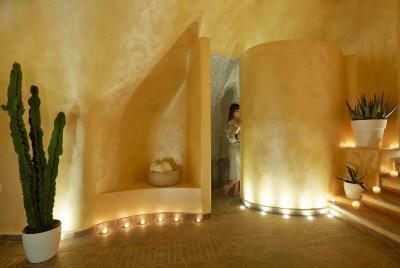 Without exception, all staff were friendly and helpful. 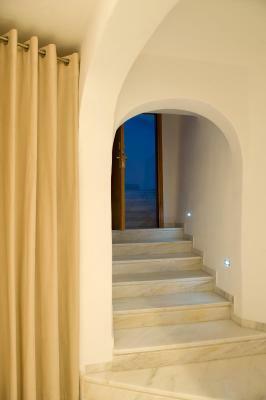 The entrance to the Gold Suites is less than 20 metres from a small square allowing for convenient drop-off - especially good if you are lugging suitcases. Great restaurants ('Avocado' rates a special mention) are close by … a 1 min - 10 min walk. Imerovigli less busy/more relaxing than either Oia or Thira, but both accessible by bus. There where a few minor maintenance items shoukd have been checked and fixed for a hotel of this caliber and price point. For example the shower holder in our bathroom came loose from the wall causing the handheld-shower to fall on the floor when switched on or off. Again just a minor item that is easily fixable and shouldn’t be there in this kind of hotel. The room was perfect. 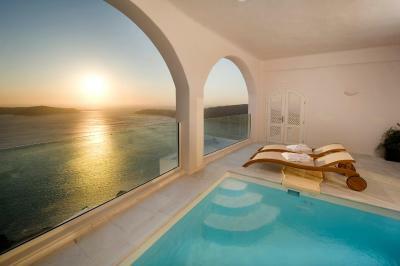 Great view to caldera and a big swimming pool! Our initial booking was mixed up and the hotel only advised this a day before we were due to arrive. The customer service manager did go out of her way to compensate for the mistake and it worked out okay in the end. 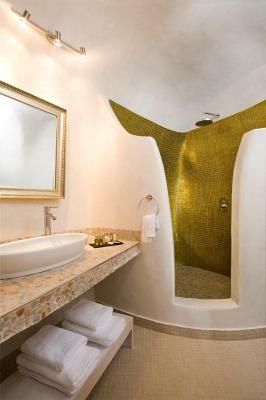 The rooms with private pools are not particularly private and there is no view of the magnificent sunset from the pools whereas you do have this from the jacuzzi rooms. Excellent location and beautiful sunsets each night. The views are spectacular. Rooms were nicely furnished and clean. Balconies in the upper floors have a better view. Staff were friendly and accommodating. Loved it here. Couldn’t fault accommodation, staff or location. 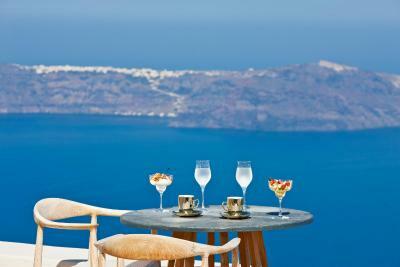 Full choice of delicious breakfast on the balcony with breathtaking views. 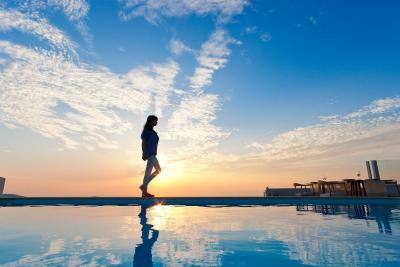 Stylish accommodation and all staff very helpful, friendly and welcoming. Fantastic location with walks along coastline to surrounding towns in front of the hotel. Visited with my grown up daughter -perfect break! Would definitely return. Bedroom, lounge, balcony with hot tub all above average - bathroom by comparison was disappointing. Small and dank. 3 stars at best. Staff was mediocre, they did not treat us with any special kindness that you would expect from a 4 Star Hotel especially with a pregnant wife. Rooms were average, bad odor especially in the bathrooms. 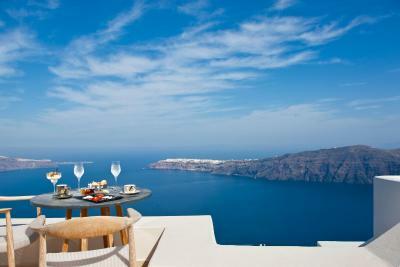 Great location, very nice view of Caldera.